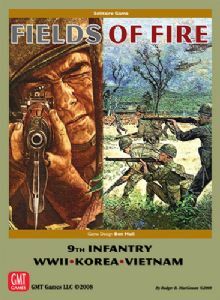 Fields of Fire is a solitaire game of commanding a rifle company between World War II and Present Day. The game is different from many tactical games in that it is diceless and card based. There are two decks used to play. The Terrain Deck is based on a specific region and is used to build a map for the various missions your company must perform. The Action deck serves many purposes in controlling combat, command and control, various activity attempts. The units of the company are counters representing headquarters elements, squads, weapons teams, forward observers, individual vehicles or helicopters. A single game is a mission and several missions from a historical campaign are strung together for the player to manage experience and replacements. A mission can be played in about 1 – 2 hours.